The RUSH MH 6 Wash is an exciting adaption of the hugely popular RUSH PAR 2 RGBW Zoom, using the same LED engine and zoom system, but additionally featuring moving head capability. 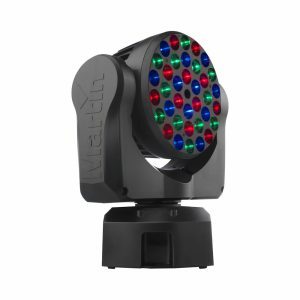 The RUSH MH 6 Wash offers a fully pre-mixed color system from 12 x 10 W RGBW LEDs with a spectacular 10°–60° zoom. It also offers full electronic dimming, strobe effects and temperature-controlled fan cooling for quiet operation. Tags: LED wash, LED zoom, Martin, martin_rush, MH, mh6, Rush, rush mh, rush mh6, Rush_zoom_PAR_2, Zoom_par.